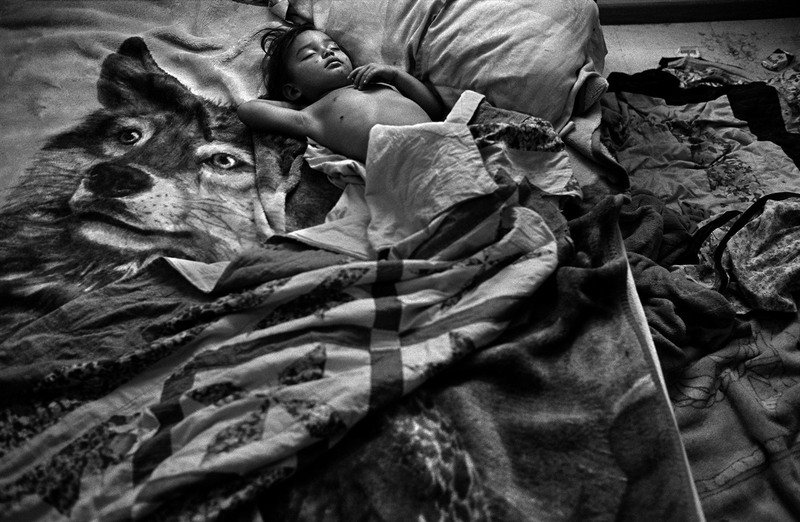 Wikuchela Waters sleeps on his parents’ bed in Allen, South Dakota. Allen, part of the Pine Ridge Indian Reservation, has been called the poorest city in America, with a per capita income of $1,539. Over 90% of the population on the Pine Ridge Reservation lives below the federal poverty line, while unemployment ranges from 85% to 90%. • What words would you use to describe this photograph? What feelings does it inspire? at all? How would you describe the photograph with this information in mind? • How could it be seen as symbolic that the child is sleeping alongside a blanket with the image of a wolf? What larger themes or ideas could the photographer be suggesting?